The oak tree is a slow growing and very long-lived tree, some specimens of which are known to be over 900 years old. The older the tree, the wider the circumference of the trunk, which can grow to be 8 to 10 feet wide. It is also a wide-spread tree, consisting of around 300 species all over the world, most of which are found in the Northern hemisphere. Oak trees have both male and female flowers on the same tree, which means that each oak can be self-pollinating, but in an oak forest, it is likely that the vast populations of insects that live on oak trees will provide the necessary pollination as they move between trees. Once the female flowers have been pollinated they wither and drop off, revealing the growing acorn, which is the fruit of the tree. Oak trees do not produce acorns until they achieve maturity at anywhere from 20 to 50 years of age. As a result, they also do not flower until they reach that age. Oak leaves are long and oval in shape with multiple lobes, making them very interesting in appearance. They have a unique tendency to grow twice in one season due to the fact that oak trees sponsor a wide variety of insects that eat the leaves during the first part of the summer. By the end of July the first growth of leaves is typically almost gone and very ragged. At the beginning of August a second growth called the lammas growth begins to appear. The leaves, depending on the type of oak, will turn brilliant shades of orange, red, yellow or brown in the late autumn months. Oak trees grow wide-spread branches, culminating in twisting smaller branches that seem to be trying to go in every direction at once. These branches extend far out beyond the tree’s center and in some cases can make the tree look as wide as it is tall, if not wider. Oak trees are excellent shade trees for this reason. These trees, when growing alone, tend to be shorter with harder wood, but in a forest situation with other oaks, they grow taller, wider and develop softer wood. 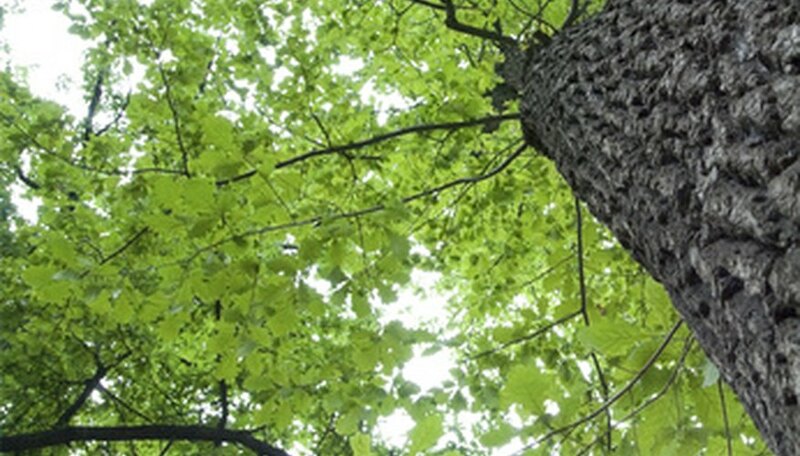 Oak trees are seldom bothered by insects or vermin that typically try to bore into the bark of other trees. They are, in fact, perfect living environments for huge amounts of insect life. They even use fungus in ways that benefit the health and well-being of the tree. The roots of the oak tree are unable, all by themselves, to bring in the nutrients and minerals the tree needs to thrive, so the tree uses fungal growths attached to its roots to deliver those foods to the tree.